AZ State Rep. Eddie Farnsworth is stonewalling gun safety legislation. He is some kind of weird gun worshipper. A gunman in Las Vegas opened fire on the crowd at a music festival last Oct 1. murdering 58 people and injuring 851 more. During the horrific crime, the shooter fired more than 1,100 rounds from his hotel room using a “bump fire” stock to turn a rifle into an automatic weapon. Today, a GOP legislator in the Arizona state house is blocking a bill that would outlaw bump stock devices and trigger cranks, defying popular support for this common-sense gun safety measure. Republican state Rep. Eddie Farnsworth, who is the Chair of the state Judiciary and Public Safety Committee said that the bill will NOT get a hearing, because he thinks it’s a waste of time and personally doesn’t support it. However, the general public is interested in having this bill heard, according to the organization Gun Violence Prevention Arizona. The bill, HB 2023, was introduced in January by state Democratic Rep. Randy Friese and Rep. Daniel Hernandez, both of Tucson. Friese, who is a trauma surgeon, saved the life of then-Congresswoman Gabrielle Giffords, who was shot in the head at a supermarket parking lot in 2011. Hernandez, who was an intern in her office at the time, held his hand over Giffords’ wound to slow the bleeding. Calling him at (602) 926-5735. Write him at 1700 West Washington Street, Phoenix, AZ 85007. Send a fax to 602-417-3122. Farnsworth is some kind of weird firearms worshipper who has voted in favor of dangerous laws to authorize gun sales without a background check, authorizing the carrying of concealed guns at schools and public places, prohibiting the creation a registry of gun owners, and naming an official state gun. 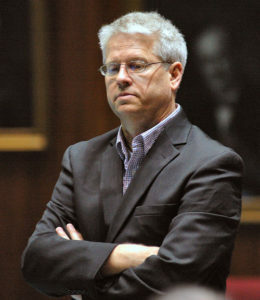 Dr. Randy Friese, a state Representative from Tucson who introduced HB 2023. In contrast, Dr. Friese sees gun violence as a public health issue, and the constant drum of shootings as an epidemic. House Concurrent Resolution 2001 is nearly identical to HB 2024, but it asks legislators to put the issue of universal background questions on the ballot. The bills Friese and Hernandez have proposed must receive a public hearing and an affirmative vote in that committee for them to advance. Oddly enough — given that investigators have had more than 4 months to do ballistics testing to determine what rifles were used — no leak, affidavit release, search warrant, or autopsy report has said that a bump-fired rifle was used. Early leaks stated that at least one fully-automatic weapon — IN ADDITION TO BUMP-FIRE STOCKED RIFLES — was found, and that others were being evaluated to see if they to had been unlawfully converted. The only weapon specified as being used was the revolver they concluded the shooter used to commit suicide. You’d think by now they’d know if the bump-fire stocked rifles were actually used. 1,100 rounds in 10 minutes is roughly 2 rounds per second. That would be impressive using an automatic rifle normally fired in bursts (as heard in video recordings). It’s fricking astonishing for bump-fire. If the shooter used bump-fire, he probably had a lot of malfunctions (explaining why he had multiple rifles). Nor do bump-fire stocks (or trigger cranks) turn a rifle into an automatic weapon. That — apparently understood by Farnsworth, if not yourself — is physically impossible, no matter what you’ve heard in the media from folks who don’t know how semiautomatic rifles work. Nor do they speed up the rifle’s “rate of fire.” They can’t. The ATF has tested and found they DON’T. I’ve found that most laymen who _think_ they favor additional gun control laws don’t actually know what laws are already in place. They are rightly concerned, but are panicked into addressing the wrong problem. The douchebags at the legislature will never pass any regulations restricting guns in this state until it turns blue.